This past February, the Philadelphia Eagles weaved the football-loving world an incredible tale, culminating with an exciting Super Bowl win against the New England Patriots that has left the city with lingering feelings of pride. 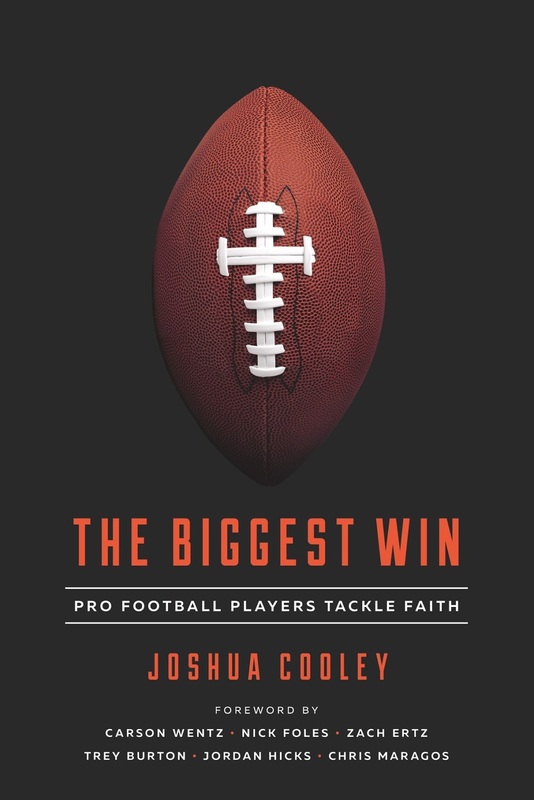 But nearly a year earlier, Joshua Cooley, one of the premier Christian sportswriters in the country, was invited to write a freelance story about the faith of a group of NFL players who were playing for more than gridiron glory. Their story, their faith and their desire to glorify God while playing the game they loved turned into a new book that gives sports-minded readers hope and direction for living out their faith while competing. 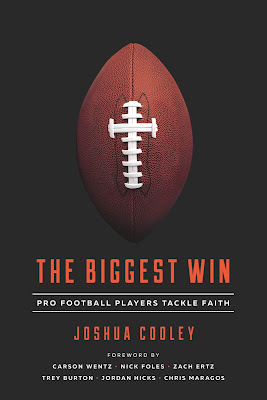 The Biggest Win, published by New Growth Press (July 30), gives athletes and sports fans of all ages a unique, insider’s look into the lives and faith of six Christian NFL players from the 2017 Philadelphia Eagles Super Bowl team—Carson Wentz, Nick Foles, Zach Ertz, Trey Burton, Jordan Hicks and Chris Maragos. Through the ups and downs of their experiences, Cooley shows how these high-profile athletes remain committed to God’s Word, genuine Christian discipleship and sharing their faith. Cooley said that when he received an invitation to write a freelance story about a group of Philadelphia Eagles players who were uncommonly devoted to seeking God’s Word together, he was intrigued. What he discovered in writing the profiles was that there was much more to be told. The Eagles’ amazing 2017 season—culminating in a 41–33 victory over the New England Patriots in Super Bowl LII and providing the 85-year-old franchise with its first-ever Super Bowl title—was a wonderful blessing for these Christ-following players. The historic championship afforded them a much bigger platform to do what every great Christian athlete does—deflect glory toward their Creator. The joint foreword to The Biggest Win from the six Super Bowl Champion players reinforce Cooley’s hope for the book. The Biggest Win combines biblical truths with practical direction on issues that every Christian faces, including dealing with adversity, competition, change, success, failure, and how to thrive by faith in a pressurized world. Encouraging male and female athletes in any sport, The Biggest Win guides them in finding their ultimate identity in Christ, not their athletic achievements, and assures them that their greatest prize is eternal life. A percentage of the book sales from The Biggest Win will go to the Fellowship of Christian Athletes, a nearly 65-year-old international sports ministry with a vision to see the world transformed by Jesus Christ through the influence of coaches and athletes. Cooley is also the author or co-author of The One Year Devotions with Jesus: 365 Devotions to Help You Know and Love the Savior, Heroes of the Bible Devotional: 90 Devotions to Help You Become a Hero of God! and The One Year Sports Devotions for Kids. He also co-authored Nick Foles’ memoir, Believe It, released earlier this summer. New Growth Press (NGP) publishes gospel-centered, Bible-based materials that provide churches, families, and individuals with resources for personal and spiritual growth and change. The growing Christian publisher produces a wide variety of gospel-centered resources for individuals, families and churches. NGP also publishes books, minibooks, small group and Gospel Story for Kids resources that provide churches, families and individuals with gospel-driven publications for all ages. The Biggest Win is available now for preorder at or Amazon.com. View the media page for The Biggest Win here or visit joshuacooleyauthor.com/the-biggest-win or the New Growth Press page at newgrowthpress.com/the-biggest-win.